The students at Stocklmeir School in California wrote these messages. We wanted to support Japan in the way we can. We could see that everybody was really worrying about Japan. Even though they did not know Japanese, they copied and wrote in Japanese. You can see that some of the messages could not be written if you did not watch the news. 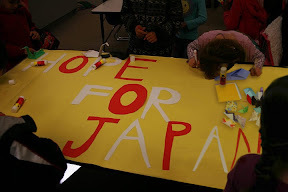 I'm glad that our school agreed to our "Hope For Japan" project, and helped us sending our thoughts to Japan. We wish that the Japanese can go back to their normal lives soon. Sean and Hiroki, thank you for helping me. The support messages for Japanese had been written by the student of the Stocklmeir Elementary School.